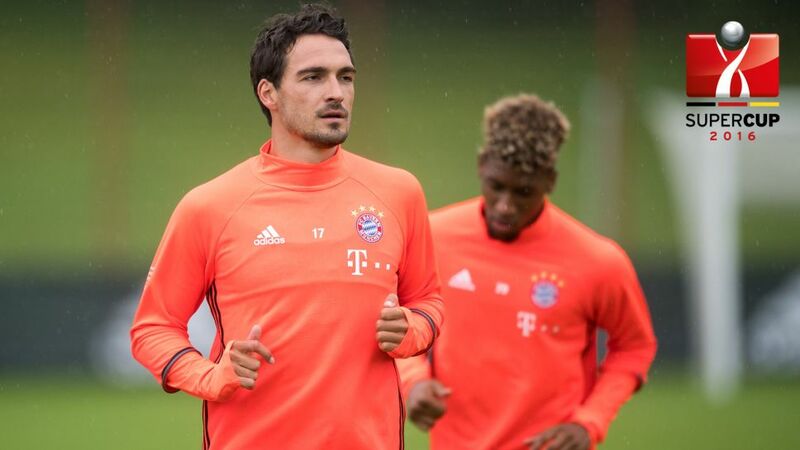 Mats Hummels' competitive debut in a Bayern shirt could come in the Supercup against former club Dortmund. The curtain comes up on the 2016/17 Bundesliga season with a titanic collision at SIGNAL IDUNA PARK on Sunday when heavyweights Borussia Dortmund and FC Bayern München go toe-to-toe for the new campaign's first piece of silverware, the Supercup. bundesliga.com will have all the build-up and take you through to the final whistle and beyond in Dortmund where the game promises to be another unforgettable Der Klassiker. 19:38 - Bye for now! That's all for today, boys and girls. We'll be back on Thursday with more build-up to Sunday's curtain raiser at the SIGNAL IDUNA PARK. Bis dann! Kingsley Coman has told kicker magazine that he wants to stay with the German record titleholders beyond the end of his two-year loan deal from Italian champions Juventus. The France international helped Bayern to a domestic double during his first year in Munich, before featuring prominently for host nation France at UEFA EURO 2016. "I would love to stay here," said the 20-year-old winger. "It was one of my goals, when I arrived, to play here for a long time. I can see myself playing here for many years, even if you never know how things will go over the years. Bayern are one of the best clubs in the world and I want to play for many, many more years here." Thomas Müller and Co. were in jovial mood at Bayern's annual Media Day on Wednesday, but it was not long before attentions turned to ending the club's Supercup drought. "The reality is we haven't won the Supercup in the last three seasons," admitted Bayern goalkeeper Manuel Neuer. "We'd be delighted if we can do it this time." BVB have returned home to Dortmund following their pre-season training camp in Bad Ragaz, Switzerland. Die Schwarz-Gelben were beaten 1-0 by Athletic Club on Tuesday in a game which saw Pierre-Emerick Aubameyang miss a penalty and USMNT star Christian Pulisic strike the inside of a post. A number of players are in line to make their competitive debuts for either Dortmund or Bayern in the 2016 Supercup. Find out who right here. Dortmund have confirmed that FIFA 17 cover star Marco Reus remains "on course" for a mid-August return to team training, despite earlier comments to the contrary from head coach Thomas Tuchel. The 27-year-old attacking midfielder suffered an adductor injury in Dortmund's defeat to Bayern in the DFB Cup final in May and has been out of action ever since. Carlo Ancelotti insists he is in it to win it on Sunday, but the new FC Bayern head coach will have to do so without a handful of first-team contenders. Renato Sanches (thigh) and Arjen Robben (groin) are definitely out, while Douglas Costa (thigh) and Jerome Boateng (groin) have only just started running again following injury. The countdown to Sunday's Supercup Klassiker has begun! To get you in the mood, check out our piece on the tantalising head-to-heads that could decide the contest by clicking this link.